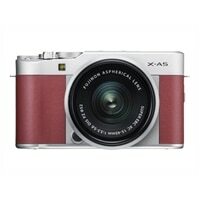 Fujifilm X Series X-A5 - Digital camera - mirrorless - 24.2 MP - APS-C - 4K / 15 fps - 3x optical zoom - Fujinon XC 15-45mm OIS PZ lens - Wi-Fi, Bluetooth - pinkThe aluminum styling and leather accents produce a stylish camera. Looking like a cool accessory, you'll want to take it everywhere. The understated leather finish produces a camera that blends in on all occasions. The slim lightweight design makes the camera easy to carry in your bag. The camera can be connected to a smartphone using Bluetooth, so you can immediately share your photos. Rotating the LCD monitor 180° automatically activates the Eye Detection AF function which focuses on your eyes, letting you take stress-free selfies. The camera makes automatic adjustments to enhance skin tones for better portrait shots. The Portrait Enhancer mode can be applied on three levels. The Eye detection AF function is automatically activated when you rotate the tilting LCD panel. It helps to achieve superior selfies by focusing on the eyes. The fast-reacting focus and intuitive touch panel operation help you capture moving objects. Add an artistic touch and bring out the great side of your subject with in-camera advanced filters. In addition to a wide range of shooting modes, the FUJIFILM X-A5 offers a selection of versatile scene positions that ensure optimum results no matter what the scene. The FUJIFILM X-A5 can record a single moment in great detail, letting you use slow motion playback to witness what you missed with the naked eye. The flash automatically adjusts the amount of light released according to shooting scenes, letting you take natural-looking photographs more simply. The aluminum styling and leather accents produce a stylish camera. Looking like a cool accessory, you'll want to take it everywhere. The understated leather finish produces a camera that blends in on all occasions. The slim lightweight design makes the camera easy to carry in your bag. The camera can be connected to a smartphone using Bluetooth, so you can immediately share your photos. Rotating the LCD monitor 180° automatically activates the Eye Detection AF function which focuses on your eyes, letting you take stress-free selfies. The camera makes automatic adjustments to enhance skin tones for better portrait shots. The Portrait Enhancer mode can be applied on three levels. The Eye detection AF function is automatically activated when you rotate the tilting LCD panel. It helps to achieve superior selfies by focusing on the eyes.